Shu-Yin's Sanctuary: I Am Impressed! Shern was on full breastmilk until about 1 1/2 yo when I switched him to formula milk. When I did that, I was also racking up my brains in choosing which formula milk to feed him. I ended up choosing Anmum Essential. So why Anmum Essential? Well, first of all, I wanted a brand which is more affordable, somewhere mid range. Compared to Enfapro which is so expensive, Anmum Essential seems reasonably priced. And I wanted a brand which is more well known and easily sourced. That was the few main reason why I chose Anmum Essential for Shern. And since Shern has no problem with the taste and no constipation problems, I stick to Anmum Essential 'til now. At that time, the price of a 1.7kg tin is retailing at around RM59.90. And since the new packaging of 'Concentrated Formulation with absolutely No Added Sugars', the price shot up to RM72.90 for a 1.6kg tin. Yes, you heard me right. Rm13 more expensive for a tin lesser by 100g. Wow.....Anmum Essential is getting more expensive! 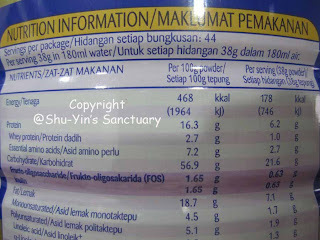 And the problem is, Shern is so used to this brand's taste that it is not easy to switch formula milk brands. I tried feeding him with Pediasure formula milk when he was having mild food poisoning and he refused it. Then I started doing some research on the newly packaged Anmum Essential. I want to know what all the fuss is about and what is the reason that they increase the price so drastically. 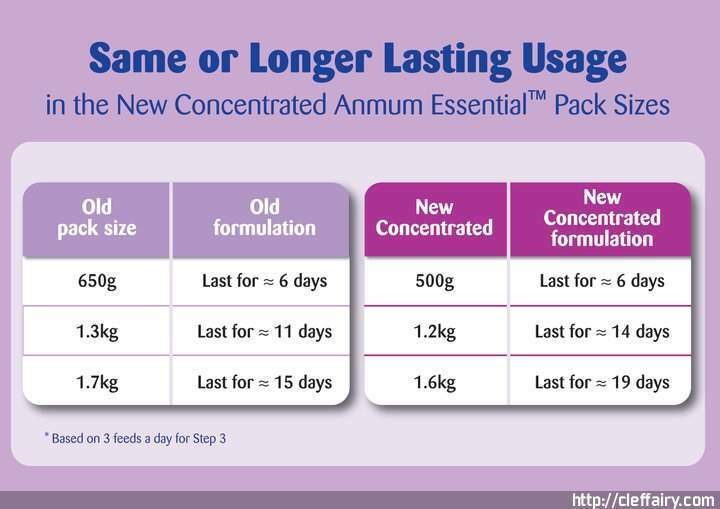 The newly improved Anmum Essential boasts of a 'no added sugar' formula. 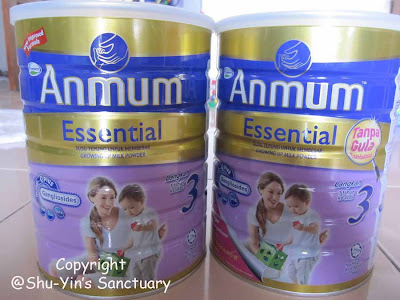 As far as I know, for now, Anmum Essential is the only formula milk brand in the market that has no added sugar in it. I want to check for myself how true is that. So I went to check the Nutrition Imformation on the tin label. I was confused because I see this being stated in the label. The 'fructo-oligosaccharide' which means added sugar in the newly improved formula seems to be more since the gram per serving is less. 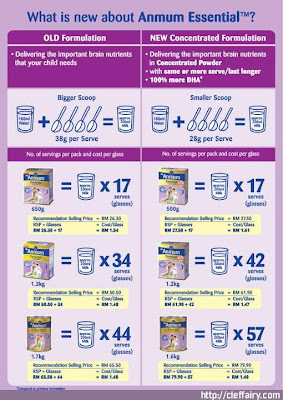 Then someone recommended this website http://www.semakgula.com.my/ which can calculate how much added sugar your child is consuming. When I entered the carbohydrates and serve size into the Sugar Calculator of both the old and new formula, below was what I found. In the old formula, there are 6-9 tsp (28%) of added sugar per serving. In the newly improved formula, there is 0 tsp (0%) of added sugar per serving. Wah...I am impressed! It is really true what they claimed to be - No Added Sugar in the newly improved formula! Besides that, the newly improved Anmum Essential also boasts of concentrated formulation. It actually claims that the newly improved formula lasts longer and is more worth it compared to the old formula. I just finished one tin of it and it is true. I made a note and the calculation stated is more or less accurate. Wah...I'm impressed again! 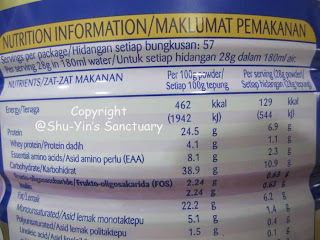 I'm an anmum member and they send me the brochure about the new formula and I straight away check on semak gula.com and my dutch lady for Jaden containing all those ingredient which is bad but I can't afford to switch it to anmum becuase it's really super expensive....how? Elly...now only i know about semakgula.com. u r a good mum...dont worry! the new packaging's price increase Rm10+ and claimed no added sugar, well, if u compare, they donhav added sugar in the old packaging too.. so why are they boasting bout it now and kept quite b4 this? just as a way to increase the price so much without ppl realising it? as wat u wrote: the higher contents of carbohydrate is dictated in any food label, that means the higher the added sugar level is..
carbohydrate is nt equal to sugar content. if the higher the carbohydrate the higher the sugar level, then how bout rice? it's full of carbohydrate. 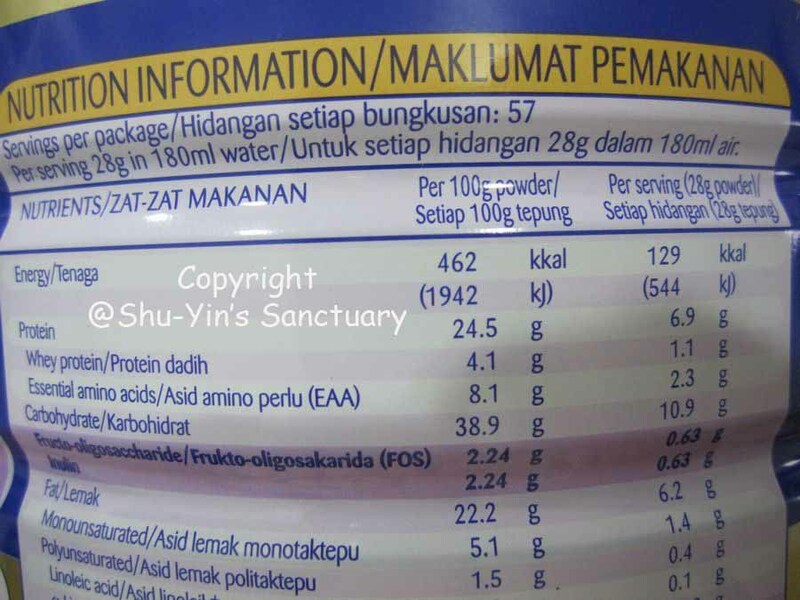 one serving of rice ~45g of carbohydrate, so does it mean it has ~45g / 9 teaspoon of sugar? lol..
are we eating that much sugar everyday? lol.. They do have added sugar in the old packaging if u read my post again (u may have missed that). Only the new revised formula has no added sugar. I'm no food nutritionist so I cant comment much about the carbohydrate thingy. im just stating what I have found about this. now we have a lot of kids who can't stay still (hyperactive kids if you wanna label them) and when questioned what type of formula milk they take, most of them took anmum. thus the news started to spread that anmum formula milk contains more sugar than other formula milk, causing those kids to be super active. i heard of all this in the beginning of this year, way before they started to introduce this so-called new formula. coincidence? maybe. think about it. if you're from the media industry, all this is nothing new. Haha. I also heard the same thing ppl said bout Enfalac and hyperactive kids. I think many formula powder brands has this kinda connection. My daughter is currently 100% on my breastmilk apart from solids. She is 21 months old now. I want to introduce formula in her diet now before she turns 2 years old or by end of the year as I want to send her to playschool next year. When you introduced AnMum to your baby, was there resistance? I have tried several brands on my daughter she rejected because it tastes nothing like breast milk. recently she drank 'some' of Mamex Gold Langkah 1' (meant for 12 month old and less though), I tasted this one, the taste is blander and less strong compared to other formulas out there, so that's why I think she took it. 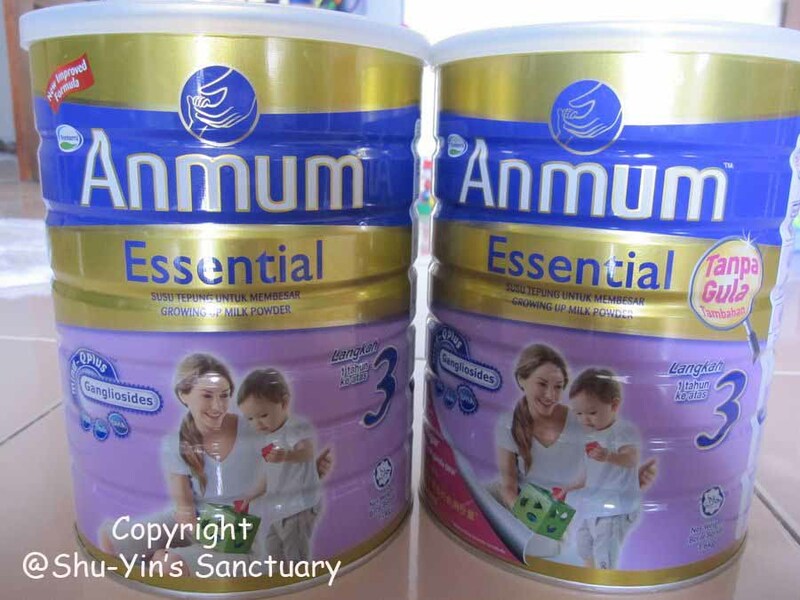 I am wondering about AnMum essential since you said your son took it..from switching from pure breastmilk. is the taste bland? since less sugar? I just asked for a sample from AnMum club and waiting for it to arrive. I have replied you via email. Thanks. 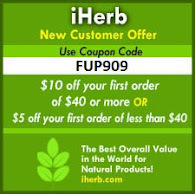 Impress with your details research and give me some idea about the product. Thanks for sharing. Personally I've tried several diferent brands and I prefer Pediasure. My kids love the chocolate flavor, and their appetite has been increasing quite significantly, and thankfully there aren't any side effects. Reviews like this for maternity milk powder must be shared to all other first time mums to be.